Half way through our journey. Half way through the year. The half way point is an interesting place to be – you look back just as much as you look forward. It’s the beginning of the end, but right in the middle. We are almost exactly in the middle of our trip. We have been on the road for nine weeks, and have just over nine weeks until we say goodbye to the Land Rover for a little while. We’ve been to the most Eastern, Southern and Northern points of the continental USA, and still have the Wild Wild West ahead of us. And we are almost exactly in the middle of the USA! Although we only have 13 states left to visit, those 13 make up almost half of the country and we will probably double the 11,000 miles that we have put on the odometer. So, at the half way point we look back at the truly beautiful times: the parks, the people, the concerts and the open roads. And the challenges: the heat, the cold, the bugs, the lack-of-hot-showers! And we look forward to even more to come: meeting amazing people with their stories, breath-taking views and being inspired creatively. This is our first long overland expedition, and even though we’re driving through a “first world” country, it’s definitely a learning curve. We’re using this as preparation for future trips in more remote places in the world. From Austin, we’re on our way into the desert, mountains and then, if we make it out the other side, back to the ocean! If you’re enjoying being part of our journey, please click “Follow” on the right of the post, to subscribe to our blog, and connect with us on Facebook and Instagram. We’ll try to keep it fun! That evening, with very muddy tyres, we went up to Nashville not knowing where we were going and without plans. But it happened that Glen, an Aussie friend from Hong Kong, was in town at the same time. The person that he was going to meet invited him to an event that night – so we ended up at launch party for Weld; a creative collaborative space for designers, photographers and artists. Never have we seen so many hipsters in one room! It was a night of connections – first we were shocked to see two guys we knew from Hong Kong – Nick “the Greek” Georgiou, who had cut his epic beard, and Brady Toops who was now a Reality TV star. And the surprises continued when Michal met not one, but two people from university who he hadn’t seen for over ten years! Nick the Greek had promised us a tour of Fort Houston, where he works. “The Fort” as it is lovingly referred to, is an old hosiery factory that has been converted into workshop space for woodworkers, mechanics, metal smiths, artists and artisans. (For more on the Fort see our write up here). Inspired by the serious motorbikes that surrounded us, Michal started tinkering with the Land Rover engine. Honestly, the engine had cut out a couple of times previously, so we knew we needed to check it. The oil was REALLY low. And Michal tried to clean the fuel pump… but it turns out that Michal doesn’t know as much as he thinks he knows about engines, and it’s easier to unscrew something than put it back together. So as we were driving away, we realised that the engine didn’t sound right… it was coughing and lurching and was obvious that we weren’t going anywhere! But thankfully, we had hardly got out of the parking lot, and the motorcycle boys either knew what to do or knew whom to call. And amazingly there was a Land Rover specialist around the corner, who said that he would come over after work to check it out. So we were stuck in Nashville… but, hey… there are worse places to be stuck! Over the next couple of days, we slowly fell in love with Nashville. The guys at Fort Houston took us under their collective wing, and we were semi-initiated into the Blackbirds Gentlemen’s Motorbike Assembly with the super spicy Hattie B’s chicken and the Fort Houston jersey. After two days of getting to know the city and the arts community, Friday morning came. After a serious breakfast of biscuits and gravy, we retuned to the Fort hoping that the part would have arrived. But when we saw that the mail had been delivered and there was nothing for us, and that I still hadn’t received the confirmation email or tracking number from the company, we started to worry… If we didn’t get it today, we would be stuck until after the weekend! Just then, I got an email saying that there was an incorrect zipcode on the order, and that I needed to call UPS to find out where the parcel was! But, Nick the Greek, a.k.a our saviour, got the address, jumped on his Harley and drove for over two hours to pick it up for us… and he even managed to grab us pizza in the process! The mechanic was busy the whole day, and didn’t show up until 7.30pm on Friday night. He is obsessed with Land Rovers, and although he knew them well, he had never actually seen the 300TDi before. He was like a kid in a candy shop! And was very entertaining… we learned a lot that evening, and not just about Land Rovers… Patrick, one of the motorcycle guys stayed with us until 1am to help us finish, before being woken up early by his 2 year old daughter… I don’t think he got much sleep! With the car fixed, there was a weight off our shoulders, and we should have been on our way. But we were having too much fun, and there was so much creative stuff going on that we had to at least stay for the weekend. Too many wonderful people and experiences to post about – artists, entrepreneurs, Land Rover lovers, lakes, barbecues, musicians… our souls were enriched and our senses were saturated! We knew that we had to get back on the road, but put off saying goodbye for as long as we could. We had really found a home in Nashville – people who we admired, were inspired by, saw eye to eye with, laughed and ate and fixed things with. We had been blown away by their hospitality, their generosity, their willingness to help us out and go the extra mile, or 100 miles, for. It’s an amazing feeling to be welcomed in to a community like the one we found at Fort Houston. What they have is truly special. We know we will be back. After checking the oil one final time, (we had changed it once, and then again by accident!) we finally set off as the sun was setting and the rain stopped pouring. And as we drove away, we were already trying to figure out how and when we could come back to Nashville. Michal realised the next day that he left his camera charger… I guess we’ll just have to go and get it! When we first bought our Land Rover Defender in 2013, we didn’t know that it was going to be a little bit like joining a secret club. But we are now proud members of the eclectic and brilliant group of people who rely on the Defender to get them to their destinations, whatever the terrain. 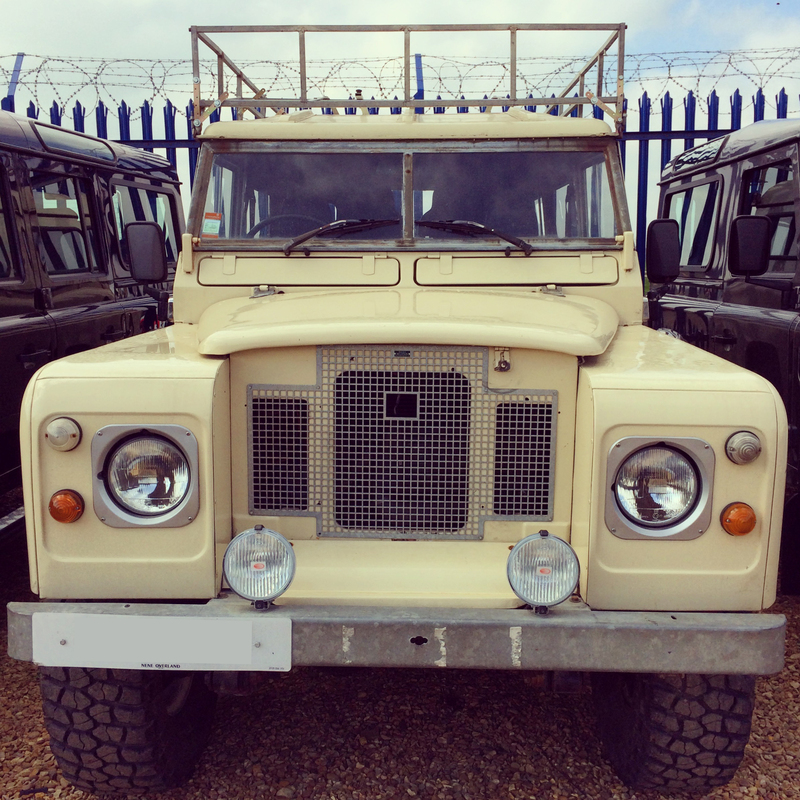 From the Queen of England to humble sheep farmers, from Bond Girls to World Famous Explorers; Defenders are the car that will get you to where you want to go. We are shipping our Defender to the USA in April, and will be calling it “home” for the next six months. And the answer is… well firstly, we’re nostalgic. We bought our Land Rover Defender in December 2013 so that we could drive it around the world. We have done a few trips in Europe in it, but we think that it’s time to really test it out on a long, diverse and challenging trip. But the second answer is that, when you buy or borrow a car, you really don’t know what you’re getting. Even if the owner tells you that it’s a reliable, unfailing engine in amazing condition, you never really know. And the Defender is pretty much as reliable as it gets! Thirdly, it’s actually pretty much the same price – when you rent for so long, it gets expensive! And lastly, we will be making it into a home on wheels. We’ll be sleeping in the back, when we’re not staying with friends, and have put quite a lot of effort into making sure it will be comfortable and safe for us! So once we decided that we were going to ship the car, the second question that we had to answer a lot is “Can you actually do that? Isn’t the wheel on the wrong side of the car?”. There are a few hoops you have to jump through. The USA doesn’t have the same customs procedures as the rest of the world (surprise surprise!) and so it took us a great deal of research and phone calls to finally figure out if we were actually going to be able to bring the car in without having to pay an enormous bond. But we eventually heard that we got the green light and we have now arranged for the car to be picked up and put on a boat in Southampton. Hopefully we’ll see it again in New York City without any extra surprises! Thank you to Kingstown Shipping and Flora and Fauna Brokers for your invaluable service. And to Nene Overland for getting the Defender ready for the trip!